When I set out to buy a bag for my Fujifilm X-T1, four criteria topped the list: Smaller rather than bulky, shoulder straps, quality for price, and color (orange). No backpack made for carrying cameras qualified, after exhaustive search across the InterWebs. But one had my attention: Filson Rugged Twill Backpack, which coincidentally is on sale for about 37-percent off. The other two colors, neither of which appeals to me, are full price. I chose instead the ONA Bolton Street Backpack, which as explained yesterday is too bulky for my bodily frame and digital lifestyle. Ahead of opportunity to reach that conclusion and reluctantly return the tote, I attempted to cancel the order before Amazon shipped it but failed. A year-old Gizmodo post by Nicholas Stango and the sudden Amazon availability of the Filson (for the sale price) and a Crumpler changed everything. Let me start by complaining about Google Search, which ability to deliver meaningful results diminishes every year; reasons why are topic best explored some other time. Based on a dozen different searches conducted to find a camera bag, the Giz story should have appeared much higher—and I can say the same for other valuable stories or reviews that popped pages down the way. Had Nicholas’ “The Best Camera Bag Is One You Put Together Yourself” presented high, I would never have purchased the ONA; Rugged Twill is the backpack I wanted, if only made to hold camera gear conveniently and safely. Nicholas also struggled to find the right sack. He rightly observes: “Camera bags are designed by camera people, when what you really need is one designed by backpack people”. Doh, of course. The bag shouldn’t impose a lifestyle. You live it, and you should define it. I want a tote that can be a backpack all the time and camera carryall when needed. On the street, the shooter should be in the hands, not on my back. 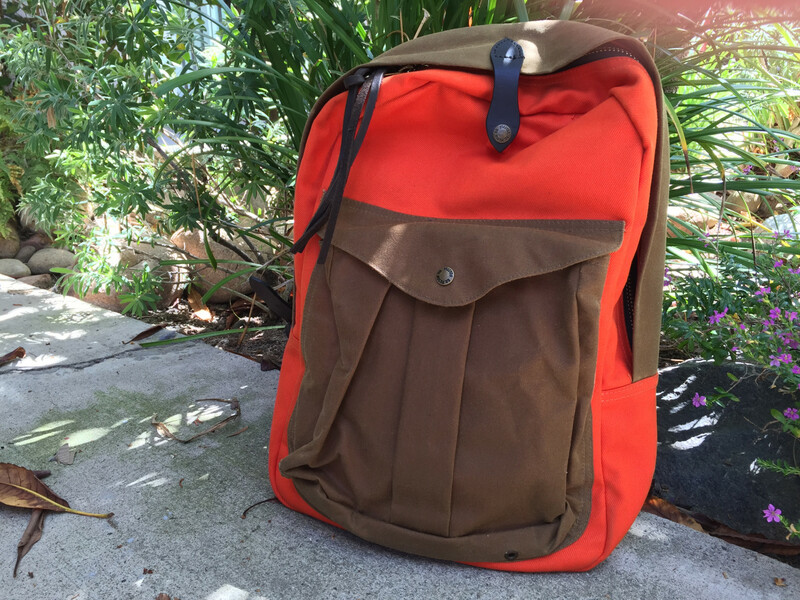 The pack is for carrying gear, including a laptop or tablet. That’s my lifestyle. Nicholas chose cycling backpack TLevel Inifinity Rollmop 43L, which has many appealing attributes but is too large for my needs or tastes. To carry camera and lens, he picked the large Crumpler Haven: “There are a bunch of brands that make inserts. Crumpler happens to be camera bag brand that made a color scheme close to what my backpack was”. I had looked at Crumpler backpacks during my initial search done days earlier and contemplated the Karachi Outpost in orange. But I hadn’t considered a small camera bag as insert into a larger carryall. The Haven’s color is close enough to the Filson backpack for compromise. I could store the gear in the bag or toss it in the backpack. Grab and go. But based on physical measurements, I reduced risk of not fitting and opted for the medium Haven, rather than the large Nicholas picked. I ordered the Filson and Crumpler gear on July 22nd. The backpack arrived on the 24th and the small bag yesterday—free shipping for each. The Rugged Twill is much better than imagined. It’s a bit weighty—more than a half-kilo (22 ounces)—but looks and feels fantastic. The two-tone colors are bold, and the material so thick outside and soft inside that I wouldn’t worry carrying camera loose. The insides are roomy without making the backpack bulky; there is place for a 13-inch laptop, too. Quality of materials and craftsmanship are so superb that the backpack is a life-time purchase you hand down to the descendants. This thing will outlast me. “Yup. Great, great, great, great granddad bought this sack”. Overall dimensions are compact: 44.5 x 31.75 x 12/7 cm (17.5 x 12.5 x 5 inches)—height, width, and depth. The Crumpler Haven is a good little bag, but I can just barely fit the X-T1 with 18-55mm lens attached, alongside the 55mm-200mm telephoto. Construction and padding seem sure enough, and the pull-top closer feels fresher visually while being more practical functionally than a zipper by providing quicker access to the gear within. The little bag is a good purchase, although I wonder if the larger, roomier sack would fit the backpack. The medium bag measures—height, width, and depth—22 x 22 x 12 cm (8.66 x 8.66 x 4.72 inches) and weighs 320 grams (half a pound). While Crumpler provides twin dividers to create three spaces, the bag’s cubic volume is meant for two storage zones for mirrorless camera or puny dSLR plus spare lens or other gear. The Filson-Crumpler is not a fast-retrieval kit, because it’s not intended to be. There will be times when I want the backpack for laptop and other essentials, for, say, a day out-and-about. The Filson-and-Crumpler combo would be more for storage between destinations. If I’m shooting, the X-T1 should be in my hands, not on my back. That’s what suits my lifestyle. The Crumpler or small bag from another manufacturer—ONA and Tenba, for example—may suit your needs. By putting together your own thang, you make the lifestyle decision, not the bag seller. My initial reaction to the “build-your-own-bag” kit is purely positive. I expect satisfaction from prolonged use, but, hey, you never know. The BYOB is also more flexible, since I can use the Filson as a camera-less backpack and the Crumpler can be carried in something else. For more dedicated shooting, I also ordered the ONA Prince Street camera messenger bag, which delivered while I wrote this post. In that, I can carry camera, lens, and iPad Air. Two purposes. Two bags. One happy shooter.